A favorite dinner classic, served on the light side! 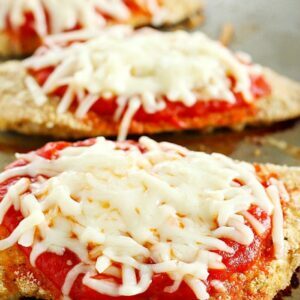 This "Skinny" Chicken Parmesan has all the tasty goodness of the classic meal, without the extra calories! Preheat oven to 350ºF. Spray a cookie sheet with cooking spray and set aside. Mix together bread crumbs, parmesan cheese, garlic powder, salt, pepper and Italian seasoning in a medium sized bowl. Beat egg in another medium sized bowl. Place chicken in between layers of plastic wrap and pound with mallet until about ¼" thick. Dip each chicken breast in egg and then dredge in bread crumbs. Place on prepared cookie sheet. Bake for about 30 minutes, or until chicken is cooked through and juices run clear. Top each chicken breast with about 2 Tbsp. marinara sauce and about 2 Tbsp. mozzarella cheese. Bake for about 5-10 more minutes, until cheese is melted and sauce is warmed up. Serve with salad, spaghetti squash, or pasta. Enjoy!